I am sitting here at a peaceful campsite, the only sounds are distant farm ones and the soporific utterances from the inhabitants of my nearest neighbour, a beech and hawthorn hedgerow. My head is in the shade (as is my laptop), my legs are in the sun and my camper van behind me is stocked with teabags, cheese and pasta. 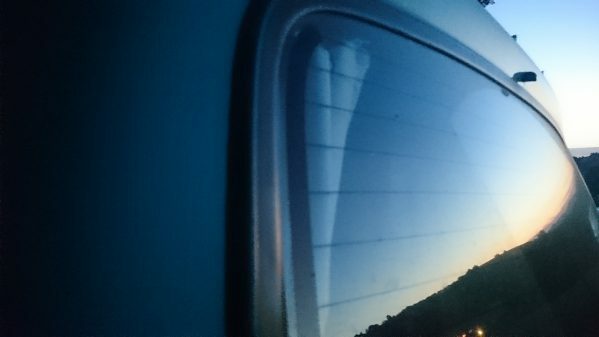 I have been working since dawn and I am very happy with my situation. If you think I have travelled to some far-flung place for my camping idyll, you would be wrong. 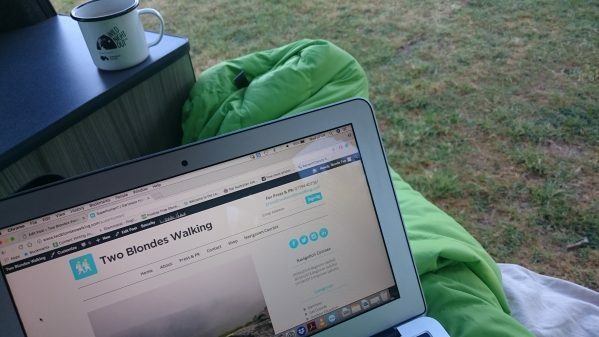 I am only a couple of miles from home, on Treacle Valley Campsite, which Blonde One and I know very well, and am part way through an experiment into the practicalities of a digital nomad lifestyle. I am here to find out whether or not it is really possible to travel whilst earning a reasonable living. Maybe freelance work and the gig economy are the key to us all finding a bit more time to Get Outside. I don’t know but here is what I have so far found out from my digital nomad experiment. I have long maintained that unpredictable neighbours are the one major downside to campsite life. Digital nomad life, it would appear, is a kind of noise lottery; you have to work when it is quiet and go for a walk when it is not. What you can choose when you are camping alone, is what time you want to start and finish work. I started just after dawn today and plan a siesta later! Some campsites these days offer device-charging opportunities but these don’t work if you forget to bring your charger (really B2). 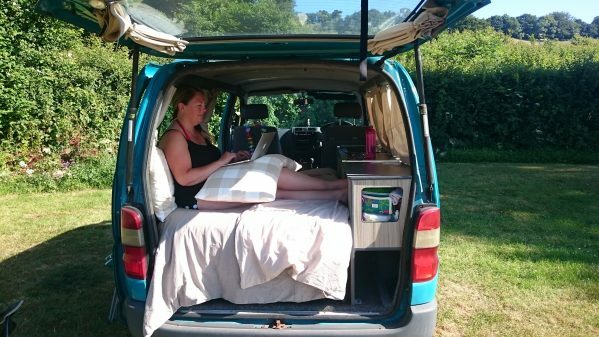 So far today I have discovered that the camper van batteries are good for a 30-minute phone charge and that my laptop can give also give the phone a bit of a top up. Mr B2 and I have been discussing battery options for laptop charging and we are planning to investigate solar panels. Nobody likes a sweaty office (apologies if you are currently sitting in one) and I was worried that campsite working inside what is essentially a metal box on wheels, during a heat wave might prove too much. It is the middle of the day and, so far, I have had the opposite experience. The van creates its own shade if I want to be outside (obviously as a Get Outside Champion I have a duty to be outside), plentiful windows and doors allow for a pleasant throughput of air and judiciously drawn curtains prevent an internal greenhouse effect. Okay so strolling across to the campsite loos might not be quite the done thing for a pair of legs such as mine, but I have discovered that campsites are pretty much empty during the day and here, snuggled in behind my van, nobody can see me or my legs, plus I have a sleeping bag to make my chair extra comfy. My freelance writing business relies on the internet, my clients are international and I use email, as well as a variety of project management platforms to keep in touch with them. 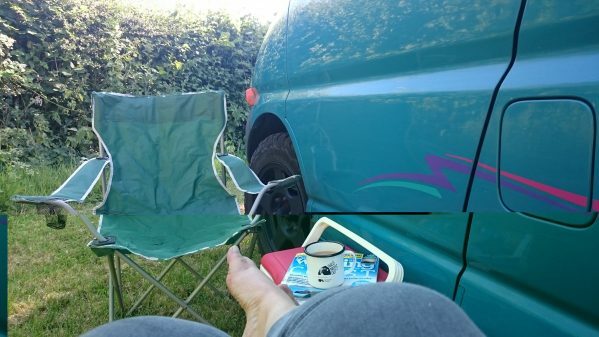 This campsite does have WiFi but not over here in the ‘Quiet Corner’ (not that the other corners are noisy), so I decided to make the most of the opportunity to find out how well I could work without it. First I taught myself how to use my phone as a portable data hotspot (this took a while), then I concentrated on setting up a work regime that allowed me to put my phone back onto ‘airplane mode’ (a great way to save battery) as often as possible. I opened all the web pages I thought I would need for a job before starting and worked onto Word documents rather than directly online. The result was impressive but a tad more time and battery consuming than I had hoped. All in all I would say that the digital nomad experiment has been a success; not least because it is lunchtime now and I am nearly out of laptop battery. I am just going to have to resort to sun-snoozing!